I love The Expendables franchise like I love Bruce Willis’s beautiful bald head: with no bounds. What is there not to love about sexagenarians hopped up on steroids blowing stuff up by the sheer force of their masculinity? No, seriously: The Expendables rocks. The Expendables 2 was equally awesome, and of course I have nothing but high hopes for The Expendables 3. If man behind the explosions, Sylvester Stallone, has anything to say about it, we’ll soon be adding one more badass to our badass list. Stallone recently Tweeted that he’s been speaking to ‘Steven S.’ about The Expendables 3, which Mr. S. is totally into, ‘if the part fits.’ Steven S., in all likelihood, is none other than perhaps the only badass not to get in on the action yet: Steven Seagal. If Seagal joins the cast of The Expendables 3, he’ll be following in the venerable footsteps of Chuck Norris – a guy I don’t normally like, but turned out to be a lot of fun in The Expendables 2 – and Jean-Claude Van Damme; two dudes who turned bit parts into moments of remarkable badassery. Let’s face it: Seagal needs the work. He was never a top-tier action star in the way that Willis, Stallone or Schwartzenegger were; his contemporary claims to fame seem to be a turn as the villain in Machete, and the A&E reality series Steven Seagal: Lawman. So I’ll be willing to bet if the money is right, he’ll take on whatever part Stallone wants to give him. If Seagal does join The Expendables 3, he’ll be joining a cast that so far includes Stallone, Mickey Rourke, Jackie Chan and Wesley Snipes. Not bad. There have also been rumors about Mel Gibson, Antonio Banderas, and a while back someone was talking about Nicolas Cage. That, plus all the originals, should make up for one hell of an action movie. Stallone himself is already comparing it to The Raid: Redemption. Set the bar a little high, there, Sly? The rumor mill will of course continue to turn, stoked by Stallone himself. 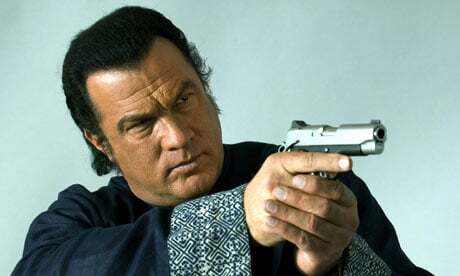 There’s no doubt that with or without Seagal, The Expendables 3 is going to be top-heavy with badasses.